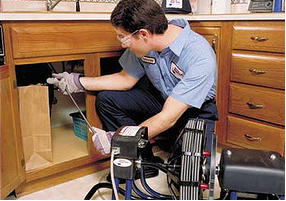 Over the years, the most common problem that I encountered in the house is plumbing related. I really hate it when out kitchen sink gets clogged up, shower head gets dirty, toilet bowl and toilet floor drain gets obstructed which can cause the water to stay in place. I know that most of the times, these things occurred due to irresponsible behaviors of house occupants. While it is an accepted fact that these are bound to happen and cannot be avoided, it would be best to get some basic information on what things can be avoided to address the problem. I used to brief my house helper to avoid putting food waste, solids and kitchen oils down the drain. I also make it a point to clean the sink and the drain pipe regularly. This thing can easily be done without even causing you to spend anything. I always keep bottles of vinegar ready in my pantry and this is not only for cooking purposes but also because of the many uses of vinegar in the house. Apart from being an effective cleansing agent for soiled pots and pans, and an effective cleaning agent to get rid of stains, vinegar can also be a good alternative in cleaning drain and pipes. This together with baking soda when poured into the drain can make your sink clog free. However, more complicated plumbing problems would require the expertise of plumbing technicians and this is where I failed most of the time. I'm having a hard time finding the right people for the job and this can result to more expenses being incurred as same problem arises as a result of inefficiency of people doing the job. I wish there is a Roto-Rooter Plumbing services available in our area as this could save me a great deal of time and effort looking for trusted people to do the job. Plumbing problems at home cannot be neglected and looking for a possible solution cannot be postponed as it may eventually result to more complicated problems later on. Besides, performance of our daily tasks might be hampered as a result. Having reliable, fast and efficient plumbing experts that can be contacted at once during the outbreak of a problem is such a relief for any home maker. To sum up, I think it would be best to keep the contact details of the trusted experts at hand for easy reference, but having ourselves equipped with a basic know how of how to solve our plumbing problems would always put us on top of the situation. Well there are things that are beyond our capabilities and sometimes things should be given to the experts themselves. I heard of the bakign soda and vinegar tandem as great cleanign agent at home. Thanks for sharing such tips.